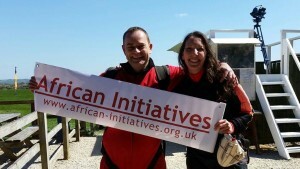 I jumped out of a plane for African Initiatives! On Saturday 18th April, Emily Moulson and her colleague Alain faced their fears and jumped 10,000 feet out of a flying plane to raise much needed money for African Initiatives. The amazing pair raised over £1,120 for our programmes in Ghana and Tanzania. Emily gives us a first hand account of the life-changing experience, in hope others thinking of doing something similar will feel inspired to take the leap! “It’s amazing how quickly three months flies by when you’re busy fundraising for a cause you’re passionate about! I signed up to Skydive for African Initiatives in January 2015 and before I knew it, it was April and I was driving to Swindon on a sunny Saturday morning to jump out of a plane! What had I got myself into? It wasn’t until I turned off at the sign for Redlands Airfield that my nerves really kicked in. The guys who ran the airfield were amazing, they went through the briefing points, putting us all at ease, cracking jokes to ease my shaky hands while we signed the forms. Then we were kitted up in jumpsuits and harnesses, and it all became very real. 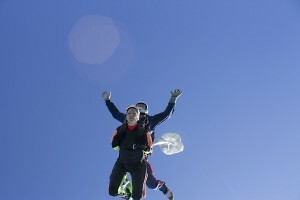 I shook hands with my tandem partner and prepared for launch. There wasn’t a cloud in the sky as the plane took us up to 10,000 feet. Harnesses were tightened, last minute pep talks given, a few quick high fives and then suddenly we were out of the plane and feeling the rush of the air as we free fell! It was amazing! 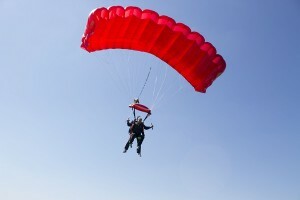 I couldn’t stop whooping and then the parachute was out and we were gliding effortlessly over the fields. The views were stunning. We made a perfect landing and by the time we got down my face hurt from grinning so much. Bye bye fear of heights – Hello £500 for African Initiatives! If you enjoyed Emily’s blog and would like to do a Skydive, run, cycle or another type of challenge for African Initiatives, please get in touch. You might get the chance to write a blog about it too!